Like Chanel and shop Rouge Coco Shine (only, no other products can be purchased through this option, which is rather inconvenient). 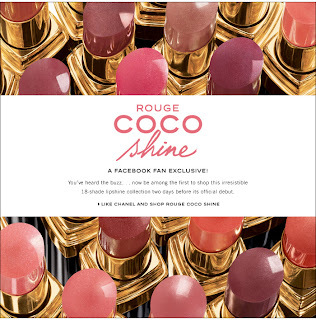 With your Rouge Coco Shine Facebook purchase, you receive free standard shipping and two samples, for two days only. I rarely post about beauty products here, but am a fan of the new Rouge Coco Shine texture and shades (Boy, Unique, Rebelle). Let me know, which shades you choose if any. Just bought Boy yesterday, hoping it's as great as I've heard!